LED lighting has come into its own over the past few years, becoming a viable replacement across the board for traditional incandescent theatrical and house lighting fixtures. Their lower power requirements and reduced heat make them ideal for converting retail/warehouse spaces into worship space, as well as retrofitting older traditional church facilities with more modern lighting capabilities. However, not all of these spaces need the complexity of a moving light console to achieve user-friendly control of the color capabilities of LED fixtures. A church may simply want to add the capabilities of setting a mood through changing the color of the lighting, and may not need functionality more sophisticated than basic scene presets or simple cueing. 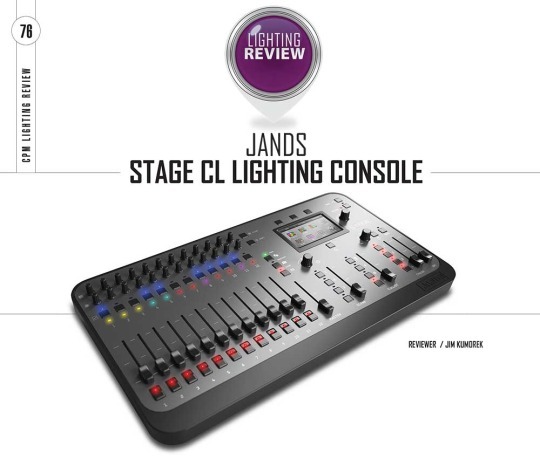 For these churches, CPM takes a look at the Jands Stage CL lighting console (MSRP $1,495). This is a fully self-contained console designed to operate up to 24 fixture groups (512 channels) of LED lighting (or standard theatrical lighting, as well). Shortly after receipt of the review unit, it was upgraded to the latest version 1.3 firmware from Jands’ website for this evaluation. The Stage CL has an attractive form factor: large enough so that the controls aren’t packed in too tightly, but small enough to not take up a lot of precious tech booth real estate. Its built-in touch screen monitor provides all the visual feedback you need, as well as control to system functions, so no external monitor is needed. Twelve faders are used to control two pages of channel faders and four pages of scene controls. Each fader has a bump button for flashing a channel or scene to full intensity. And each channel also has a selection button, saturation knob and hue knob for controlling color. At the center of the console is the master fader and buttons for scene activation, snapshot activation, selecting the page currently mapped to the faders, shift, and clear. The Stage CL is very simple to operate, which is the main point of this console. Patching fixtures is as simple as using the touch screen to select one of the 24 ‘slots’ that a fixture can be assigned to and setting its type and address. Most major fixtures are represented, and with LED fixtures, their DMX profiles are pretty standard, so if the fixture you are using is either not found in the library or is simply unknown, one of the generic fixture types will probably work for you. You can patch up to 24 fixtures into the console, which are presented as two pages of 12 to the user through the fader section. If you have more than 24 fixtures, you’ll need to start making some grouping decisions. For example, if you have six fixtures that you use for backlighting, and you can live with always setting those fixtures at the same color and intensity, then you can give them all the same DMX address and treat them as if they are one fixture in the console. Once patched, each fader strip works as a hue, saturation and intensity (HSI) system, with the fader controlling intensity, and the two knobs controlling hue and saturation. You can also influence the color via the touch screen’s color mode, where you can pick specific color squares, use a color-mixing pallet, or adjust RGB values. To access channels 13-24, you turn on the page button, and the faders and knobs now work with those channels. However, the console does not have motorized faders that ‘snap’ to the current setting for the new page. Therefore, to have the fader take effect, you need to move it through the point where that channel was previously set for that channel. For example, if you set channel one to be at 50%, then press the page button to use the same fader to work with channel 13, you need to move the fader down to zero (the current value of channel 13) before the fader starts to change the value of channel 13. If you then switch back to page one, you need to move the fader through 50% for the fader to start changing the value of channel one again. This support for 24 channels was recently added in this latest firmware upgrade. As with any con¬sole that tries to ‘double up’ on controls like this, it’s a little clunky, and I’d prefer not to run an event manually this way. But for program¬ming scenes or a cue list, it’s not bad. There’s a colored LED right below the select button for each channel that reflects the intensity and color of the fader, so you can get an idea of what the output of the console is without looking at the stage. You can also see this on the touchscreen using the mimic setting of the monitor window, where the current output value for all 24 channels is displayed. If you use the select buttons to select multiple channels, the hue and saturation knobs for one channel in the selection affects all selected channels, which is rather handy. There are several different ways you can run lighting for a service with the Stage CL. First, you can simply set levels for each channel via the faders. If you want to do a smooth transition to a second look like you might do with a two-scene preset console, you can press the ‘Snapshot’ button and the output of the console is frozen. You then adjust the faders and color knobs to the new values you desire using the LED for each channel to see a close approximation of the color you’ll get, and press the Snapshot button again. The console output now crossfades to the new settings. Cue programming was equally straightforward. Set the output levels via the faders, press record and then the Play button in the cue list section, and a new cue is recorded. You can also insert new cues in the middle of the cue list, delete cues and edit cues—the functionality is pretty robust for this level of console. There are also two ways of programming scenes with the console. First, you can set up a look or scene with the channel section, press Record and then one of the four scene buttons. To activate a scene, you simply press the scene button. To release it, you press that scene button again. Sort of. More on this later. Alternatively, you can program scenes into one of the scene pages for the fader controls. When you switch into Scene mode for the fader section, the faders then control up to six pages of 12 scenes each. The Chase feature is pretty cool and sophisticated. You can select a set of channels and easily program in a nice chase by selecting one of the pre-defined chase patterns in the console. Or if none of those will suit your purpose, you can program your own sequence manually. Chases affect both intensity and color. When running cues, chases and/or scene buttons, you can monitor what’s affecting your lights through the touch screen and select specific items to release—or release all if desired. The Stage CL has some very interesting features, and is quite simple to use. The Scene preset section is well thought out, and its behavior in different situations is rather logical. If you happen to have a scene activated, and instead of activating another scene button like you intended you accidentally press the current scene button causing your lights to start fading out, you can press that same button again before the fade is completed and it will immediately jump back to that scene’s full intensity instead of fading, providing a quick recovery to an ‘oops’ situation. When a scene is up, pressing its button again causes it to fade out. But, if you bring up another scene whose recorded channels overlap the first scene, and then you press the button for that first scene again, it replays that scene again instead of fading it out, to reassert its overridden attributes. I could see a user preferring for it to just fade out, but I think this makes the most sense. The Scene mode of the faders also worked great. There are options in the color palette for applying a pattern effect to the currently selected lights, and this is pretty cool to get some nice color chases with almost no effort. The selection of options here are very nice and useful. Bottom line, the Stage CL console offers a full-featured, reasonably priced option for a church wanting simple control over LED lighting for their facility. The console was clearly originally designed for controlling just 12 channels. I can see Jands getting requests to be able to control more than that, and thus their work to add in an additional page of fixtures. It does work well, but I think I’d prefer to go with the Vista software solution over the Stage CL if I needed more than 12 channels. But that’s just me—I’ve never been a huge fan of doubling-up on controls if it can be avoided. For a small church stepping up to color-changing LED lighting in their facility, the Stage CL is well worth consideration.